Claudia wanted to do more than just run away. She wanted to prove a point to her parents about the injustices at their home. So, she decided to not run away from something, but to run towards something, the New York Metropolitan Museum of Art. With her younger, and more frugal, brother in tow, Claudia and Jaime find themselves caught up in the middle of one of the greatest mysteries to ever enter through the museum doors. E.L. Konigsburg is one of my favorites children’s authors, and I’m sad to say I never discovered her work until my Children’s Literature class in college when I read A View From Saturday. In this Newberry Medal Award winning title, Claudia is an incredibly smart and talented girl, saving her allowances and planning for her great runaway for weeks before recruiting her younger brother Jaime to join her. Unhappy with the distribution of house chores, Claudia decided to leave the home for a little while, to send her parents a message. Once at the museum they embark on a treasure hunt to find out the truth behind a new statue, Angel, that came full of fanfare and fame to the museum during their stay. Although it wasn’t as fantastic as A View From Saturday, From the Mixed Up Files of Mrs. Basil E. Frankweiler was enjoyable. It followed a steady pace as the narrator, Mrs. Basil E. Frankweiler tolde story of the two children in letters to her lawyer. I loved the arguements between Claudia and Jaime, they felt very honest and very true to the types of arguements kids get into. Since the book was written in 1967 it was pretty fun to see what the worth of a dollar was, versus now. This book lends itself well to many discussions between parents and children. 2. The different formats of art; paintings, sculpture, etc. 4. Sibling rivarly and loyalties. I think the concept is really fun, I mean, what booknerd didn’t want to spend the night at a library at some point in their lives? I felt that the ending wrapped up to neatly and didn’t satisfy me. I felt like Claudia and Jaime gave in too easily and the resolution wasn’t as great as the buid-up and the mystery. The language is a bit outdated since the book is over 30 years old, but I think this will still be a fun book for younger kids. The book is a two-time Newberry Award Medal winner and has also been turned into two motion pictures. The Janus Gate is part of the Art Encounters Series by Watson-Guptill publications. This title features John Singer Sargent and his particularly haunting painting, The Daughters of Edward Darley Boit. Using this picture as the basis of the story, Rees takes us through a psychological horror story of demons, dolls and lunacies surrounding the four sisters and their neurotic and unhinged mother. While their father is away on a business trip to Boston, Sargent is commissioned to paint a portrait of the daughters Boit and one very ugly doll named Papau. What Sargent paints is a mystery that some comes to life, engulfing him and the girls, unless he can find a way to break the spell. When Sargent first met the family on Varnishing Day in 1880, the daughters were full of life, laughter and happiness. Based on the picture, you’d think I was lying. During the time between Varnishing Day and the day Sargent met with the Boits to start painting the girls, they had changed, grew darker and more inward. Florence would only speak in rhymes, while Jane would act-out in fits of brattiness. Mary and Julia, the youngest Boits, remained silent, stubborn and scared. The book is just the right amount of creepy for the age group. Its neither too simple nor too complex, my only wish is that the book was longer so that Rees could flesh out the characters and the evil in the story a little more. I loved the connection to art, and bringing art and artists to life. I think both younger kids and teens will enjoy this supernatural gothic tale, and it works as a good springboard for future readers of the Libba Bray title, A Great and Terrible Beauty as well as Tracey Chevalier’s Girl with a Pearl Earring. Told through the eyes of Kristy, Claudia, Mary Ann and Stacey, we get a look into the lives of the four girls who would later form The Baby-Sitter’s Club. Kristy is unhappy that her mom is dating again. Mary Ann is constantly struggling to prove to her father that she is responsible and is no longer a baby. Claudia is making some tough decision about growing up and growing away from two of her best friends. Stacey is new to Stoneybrook and trying to find a place to fit in, despite her diabetes. 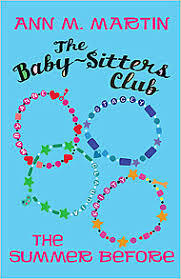 Although this book was written years after the Baby-Sitter’s Club series ended, I thought that the stories held true to each of the four girls and their friendships. At times the narration felt more like a flashback, an adult Kristy or Stacey recapping that summer in their lives. The voices and conversations were far more mature than what I would expect an 11 year old to say. For those that read through the entire series and the spin-off stores like I did, this book doesn’t really supply you with any new information about the girls. I did like reading from all four perspectives, especially about the same events that happened during the course of their summer break. It was also the perfect length, in total pages and per chapter. There was an even number of chapters for each girl, but I did feel that Kristy took center stage a lot. That’s probably because quite a few of the Mary Ann chapters were about Kristy. I thought the Mary Ann chapters were fairly boring, and the Claudia chapters about growing up and having a first boyfriend were the most entertaining. This is fairly odd for me, because reading the series I loved the Mary Ann books and usually skipped over the Claudia titles. The conflict and drama is pretty low on the richter scale, so it might come off as too slow for kids 11 and up, but the younger crowd will enjoy it. Older Baby-Sitter’s Club fans will appreciate the book for its nostlagia and younger readers will enjoy it for a peak into the lives of the girls before the club. I also heard that Scholastic began reissuing the series in April this year (hence the timing of The Summer Before). I’m not sure how many libraries will reinvest in this series, since it is nearly extinct in most library systems in the US. I’d like to see the BSC series make a comeback though. It was one of my absolute favorites growing up and one of the main reasons I was such a book nerd. In case you missed the BSC tribute back in November, follow the link to a week-long tribute started by everybody’s Friend Amy to your favorite girls and books from Stoneybrook, Ct.
On their way home from school, Jack and Annie stumble across a mysterious tree house in the tallest tree in the woods. Inside the tree house are old books, and new books. And books that can take you into new worlds with new adventures. For Jack and Annie, they are taken into the long lost land the dinosaurs. Jack is the older brother at 8 and a half years old. Annie is the rambunctious, and curious 7 year old. In the first installment in a series of over 70 books in the span of a decade, Jack and Annie explore the land of the dinosaurs, making friends and trying to find a way home before they become dinosaur dinner. The Magic Tree House series began in 1992, and I feel like that the last children’s librarian to read this title. The series incredibly popular with kids. I would highly recommend this book to young readers that enjoy either adventure or fantasy books. Jack and Annie are very simple characters, and there are no greater themes underlying the story. It is a simple adventure story of a boy who loves to learn and a girl with a world of imagination at her disposal. I think these two kids are very lucky. Who wouldn’t want to find a mysterious tree house filled with books that can take you anywhere in space or time? Dorothy is a 10 year old orphan who lives with her Aunt Em and Uncle Henry in a small town in Kansas. One day, a terrible tornado strikes her home and whisks her, and her pup Toto into the brand new world of Oz. Once in Oz, Dorothy is introduced to a number of different creatures including, but not limited to: the Tinman, the Scarecrow, and a cowardly lion, as she tries to find her way back home to Kansas. Believe it or not, this is my first time reading this book. I’ve seen the movie with Judy Garland a number of times since my childhood, but I’ve never actually picked up the book before now. Reading this book, I had few references floating through my head. I kept thinking about the movie, and I also kept thinking of Wicked by Gregory Maguire. Since I had the movie in my head, I picked up on a few major differences between the book and movie. For one, in the book Dorothy has silver shoes not the ruby red you see in the technicolor movie. The movie also added extra characters in Dorothy’s life in Kansas. In the book, we start immediately with the tornado that takes Dorothy to Oz. I think what I like the most about Baum’s writing was that it reminded me of my favorite contemporary children’s authors. I could see snippets of Roald Dahl books (the orphan child goes on an adventure) and Neil Gaiman’s books (strange creatures in strange new worlds) in this book. 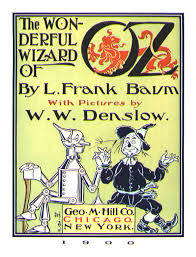 Baum was a very influential author to have created a world like Oz with all its inhabitants. He went on to write about 13 sequels to the Wizard of Oz, most of which have at some point been transformed into a movie. This book was also read for the Read, Remember, Recommend Challenge hosted by Bibliobabe. The Dunderheads are a group of kids with very special talents. From a photographic memory to the ability to spit farther than anybody else in school. Mean teacher Miss Breakbone has a penchant for making students cry and confiscating everything she sees. The Dunderheads are a smarter group than she anticipated. By putting their individual strengths together, they are able to fight back against her mean ways and save the day for one of their close friends. This book is adorable. An odd description, I know, but its fitting. This short book is a fun read for boys and girls alike in 1st and 2nd grade. This book will teach younger kids to stand up for themselves, acknowledge their individual talents and learn the art of sharing and teamwork. Half Minute Horrors is a compilation of short stories by over 30 authors including Neil Gaiman, Lemony Snicket, Libbra Bray and Erin Hunter. The stories alternate from brief one-page tales, to poems and comic style renditions of nightmarish tales. There are tales of monsters under the bed, lurking shadows, kidnappings, and murder. Truth be told, I was a little disappointed by the book. The tales weren’t really that scary and after a while, they started to feel repetitive. Some were very clever, like Stacey Godiner’s The Pink Bicycle; a tale of premonition. Others felt incomplete or were just plain boring. I did like that many heavy-weight authors participated in this compilation. I was surprised to see Margaret Atwood, James Patterson and Gregory Maguire on the author list, I didn’t think they wrote for kids. Some of my favorite stories were the psychological fears that children felt. These stories are more of parent’s worse nightmare than of a child’s nightmare, particularly those where children disappear into strange houses, or get thrown in the below freezing pond during summer camp. Some gave me chills and made me go “ewww” (The Babysitter by Erin Hunter for those that read the book). I would recommend this for younger kids looking for scary stories, read in small portions the stories can be very frightening. Hiroshima is a novella detailing the events of the atomic bomb attack in Hiroshima on August 6th, 1945. Yep centralizes the story on two tweleve year old sisters named Rikko and Sachi, composites of a number of resident’s of Hiroshima at the time. the majority of this book is a non-fiction and very straight forward account of the attack during World War II. There is a terrible wind. Houses collapse like boxes. Windows break everywhere. Broken glass swirls like angry insects. The wind strikes Sachi’s back like a hammer and picks her up. She feels as if she has fallen into boiling oil. It tears away her special hood and even her clothes. The wind sweeps her into the whirlwind of glass. One of the most powerful bombs ever created, the nuclear bombed was dropped in Japan as retaliation against Japan’s surprise attack on Pearl Harbor 2 years prior. Quick to discover the enormity of their mistake, the US rushed to work with Japan after the war ended, going as far as bringing in the Hiroshima Maidens for major reconstructive plastic surgery. Yep goes further into history by briefly explaing how the world reacted to the bomb, how other nations began developing their own bombs and the treaties signed to ensure that no one would use or test these bombs in open space where it could cause more damage or radiation to any living creature. This is an excellent companion book to 1000 Paper Cranes by Ishii Takayuki. Sadako Sasaki died from the radiation poisoning from the bomb and tried to make 1000 origami cranes to follow a fable that anyone who makes 1000 cranes will have 1 wish granted. 1000 Paper Cranes is another tale of a girl in Japan ten years after the bomb had been dropped, Sadako and the Children’s Peace Statue built in her memory. Eddie Dickens is sent away to live with his Mad Uncle Jack and Even-Madder Aunt Maud while his parents suffer from a strange disease that makes with yellow and crinkly and smell like old hot water bottles. Unfortunately for Eddie, traveling anywhere with a mad aunt and uncle is not as much fun as a young boy would hope it to be. Eddie soon sets off on a series of adventures and events in a book set in the late 19th Century. For parents that consider A Series of Unfortunate Events to be too dark and dismal for their kids, this book is a good compromise. Ardagh’s play with words and puns creates characters that are irreverant, and ridiculous. Kids will find the incompetence of the adults to be entertaining in comparison to Eddie’s quiet and intelligent attitude. There are many similarities between this book and the Series of Unfortunate Events; the children are more competent than the adults, the children find themselves in dangerous situations based on the actions of their guardians, and the author even defines certains words and terminology in a similar fashion. While I think this book is a good alternative to readers that are not quite ready for the Lemony Snicket books, the Eddie Dicken’s trilogy is not the most original nor the most entertaining. Eddie’s mad aunt and uncle are more annoying than funny, and the same can be said for his parents. There is very little plot in this book as it is mostly filled with silly anecdotes and it really doesn’t feel like a cohesive story. One thing to remember, is that this book was written for kids, not adults reading kids books. Lemony Snicket wrote for both parents and children, which is why so many more adults prefer that series. For younger kids, the Eddie Dicken’s trilogy will be an entertaining read.